As you can see, all major databases are supported. On the Windows platform, you can also connect the other database types using the ODBC driver. Again, the next option is Alias, and you must fill it to use your connection in your project. SQL Read Query. This query is used to read values from the database. You can specify any valid query to the database, including conditional statements. In the Write Query section, you should specify a TEMPLATE for the SQL Query, which will be used later for the write commands. 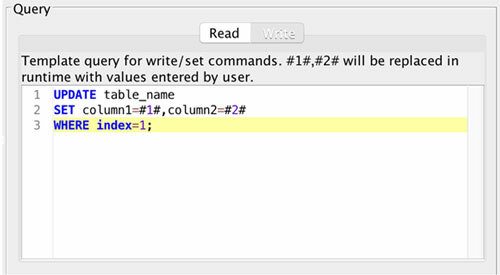 In the query, you should use a placeholders #1#, #2#, and so on in place of values. 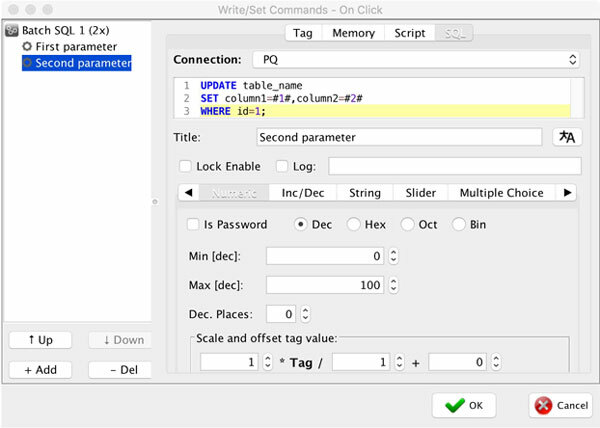 The placeholders will be replaced with real values provided from the write/set command during runtime. TIP: You can create multiple connections to one database to use different SQL queries and retrieve multiple data.